*Caught up with Viz Media's Urian Brown while we waited to catch our plane to San Diego on Wednesday afternoon. That's always a good way to start the week. *Caught up with Team Cul de Sac mastermind Chris Sparks on the convention floor at Preview Night. He was my roomie for the duration of his trip, and we both survived the experience. *Saw Raina Telgemeier and Dave Roman almost immediately, for about the fiftieth time in the past two weeks. But if you're going to run into people over and over and over again, they're pretty high on my list. *Thursday through Sunday I ran the Cartoon Art Museum's booth at the convention with Seamus Smith, Kraig Rasmussen, Nina Taylor Kester, and Suman Rizvi, with far too many artists to list or tag here. I'll give a special mention, though, to Sinclair Klugarsh, who may have put in more hours at the booth than I did this weekend. The guy's a machine. *Highlight of the convention Thursday was meeting Samantha Newark, the voice actress behind Jem/Jerrica Benton, one of my big childhood crushes. I managed to be cool and professional, throughout, I think, since she's still on board with letting me interview her for my forthcoming eighties animation book. *At Thursday night's Andrews-McMeel Happy Hour, I caught up with editor supreme Shena Wolf, chatted with Dana Simpson Brodbeck (whom Shaenon K. Garrity and I had recently seen at the ALA Conference in San Francisco), talked to Tom Racine himself, plus I met Francesco Marciuliano for the first time, after being a longtime admirer of his work (check out Medium Large if you haven't yet. You won't regret it). *First panel of the weekend was Modern Comic Strips with Lalo Alcaraz, Hilary Price, and Jen Sorensen. It was a fun talk, and they seem to all still be speaking to me, so I guess I managed not to permanently traumatize anyone. I'll have to try harder next time. Kristin Gottschalk was in the audience to make sure we all behaved ourselves. *Also in the audience were Michele Ivey and Tokka Oroku, who surprised me with a custom TMNT action figure at the end of my panel. They were there at least in part because the talk immediately after ours was a big TMNT toy panel, but it was cool to have some Turtle Power in the audience. *Caught up with Tom Galloway and went to the Eisners on Friday night, and it was a really fun ceremony. Lots of great comics won awards, and it was a really comics-positive night. I'm kind of hoping that Michael Davis gets tapped to present at every single awards show ever. *Extra-special highlights were seeing Don McGregor win the Bill Finger Award, Raina Telgemeier collecting a trophy for Sisters, Gene Luen Yang's writing on Avatar and The Shadow Hero earning an Eisner, and the great Richard Thompson winning for The Complete Cul de Sac, a book that belongs in every house in the world. *Moderated a fun panel about writer/artist collaborations with Steve Lieber, Kelly Sue DeConnick, the Tamaki cousins, Asaf Hanuka and Boaz Lavie. Fun group, and we could have talked another hour beyond our allotted time. *Same goes for my Kids' Comics panel with Art Baltazar and Franco, Dave and Raina, Skottie Young, and Katie Cook. Before that got started, Eddie Ibrahim of the Comic-Con International crew asked me if he could make an announcement. 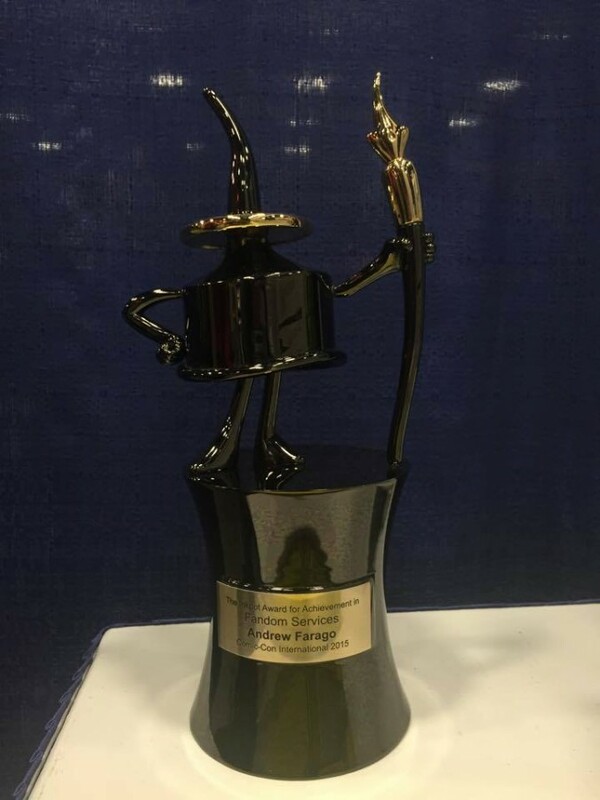 I figured someone on the panel was probably going to receive an Inkpot Award, since that's usually the reason that Comic-Con makes a pre-panel announcement, but it didn't occur to me that they'd be giving it to me. That's a very, very cool thing, and I want to thank Eddie, Fae Desmond, David Glanzer, Jackie Estrada, Gary Sassaman, Tommy Goldbach, Justin Dutta, Sam Wallace, and all of the other fine folks at Comic-Con that I've worked with over the years for saying, "what could possibly go wrong?" and deciding to give me an Inkpot. It means a lot to me, and I've got it prominently displayed on my mantel already. *Caught up with Fantagraphics Books Inc. editor extraordinaire Kristy Valenti for dinner on Saturday night, and as always, we ended up sitting around the kitchen table eating cheesecake and talking about relationships. I think we were about three beers away from convincing Jaime Hernandez to draw our Golden Girls fanfic, but maybe that's just wishful thinking. *I met Cece Bell on Sunday, and can't recommend her Eisner-winning graphic novel El Deafo highly enough. It's the type of book that should have existed decades ago and been on every school library's bookshelf, but I'm glad it's around now and will be read by kids and grownups for years to come. *Had a booksigning at the Insight Editions booth on Sunday afternoon, and it was nice catching up with their crew. Not the wall-to-wall craziness of last year when my TMNT book had just been released and I got to do a signing with Kevin B. Eastman, but fun all the same. *My big fun project at the show was getting people to add sketches to my Robin's first birthday sketchbook, which was a great way to catch up with friends as they drew cool pictures for Robin (of robins or Robins). In addition to getting all of the kids' comics panelists to add to the book, I managed to get some really nice drawings from Stan Sakai, Steve Purcell, Ronnie del Carmen, Jen Wang, Lea Seidman Hernandez, Debbie Huey, Benjamin Seto and Mick Gray. Looking forward to handing that over to Robin when he's past the ripping-and-eating paper stage. *By Sunday afternoon, I was BEAT, so I left the convention center about an hour earlier than I'd planned so that I could get some fresh air and enjoy the scenery before heading off to the airport. Flight back was quick and uneventful, and it was great to be back home with Shaenon and Robin. *And I'm already looking forward to doing it all again next year. Did I mention I've got a WordPress site? I'll update my professional (mostly non-Carton Art Museum) projects over there, including my bibliography. Thanks to the great Evan Dorkin for posting stuff on LiveJournal from time to time to remind me that I should do the same. When I took on the Curator job at the Cartoon Art Museum (I'd been on staff for a few years already, and had assisted on most exhibitions), I had a few exhibitions lined up, maybe a year's worth, and I had a short list of proposals that I was slowly picking off. Political cartoon exhibitions, comic book shows, animation, notable anniversaries of comic strips, etc. One of the suggested topics was "Mary Blair." I asked Shaenon if she'd be interested in helping out with that one, and if I should pursue it, and she encouraged me to run with it. I asked one of CAM's board members, a longtime Pixar staffer, who to talk to about Mary's work, and he put me in touch with Pete Docter. Pete put me in touch with Mary's son, Kevin. He'd apparently turned down exhibition requests before, but I must have said something that he liked, so he invited me and Shaenon to his house to look through his mother's archives. We drove to Kevin's house and spent an amazing day looking through Mary's art, hearing stories about her work, stories about growing up in a Disney family, photographing art, taking notes, and (thanks to our rental car's battery running down) taking Kevin out to lunch while we waited on a recharge. That led to a great 60-piece exhibition of Mary's work at the Cartoon Art Museum from 2007-08. A day or two before the exhibition opened to the public, Shaenon and I gave a private tour to Walt's daughter, Diane Disney Miller, whose Walt Disney Family Museum was about to open (facilitated by former CAM staffer Anel Muller). Diane told us stories about Walt, and Mary, and she absolutely loved the exhibition (and bought most of the artwork for the Disney Museum's collection after our show wrapped up). A month or two later, I gave a tour of the exhibition to Koji Hoshino, president of Studio Ghibli, who was in the Bay Area visiting Pixar. Our opening reception was in December, and that was attended by Kevin Blair and his cousins, plus Pete Docter, and Pixar's Dice Tsutsumi, Enri Casarosa and Ronnie del Carmen, who talked to me about their own exhibition proposal based on an upcoming charity art auction called "The Totoro Forest Project," which was in the planning stages. Before the exhibition concluded, Studio Ghibli informed me that they wanted to put together a massive Mary Blair retrospective for display at the Tokyo Contemporary Art Museum, featuring the entirety of Kevin Blair's collection, plus highlights from the Walt Disney Animation Research Library. Shaenon and I were tapped to facilitate things stateside, which meant that we'd take two extended trips to Japan--once to deliver art for the exhibition, once to bring it back. Sadly, Kevin Blair passed away not long after the Cartoon Art Museum's Mary Blair retrospective. His cousins speculated that he may have known that his poor health was catching up to him, and that may have been part of the reason he was working so hard to get bring attention to his mother's work again. The Japanese exhibition proceeded as planned, with Kevin's cousins (Mary's nieces) working alongside us to prepare the family's work for travel. Studio Ghibli and the Japanese television network NHK put together an incredible exhibition at the Contemporary Art Museum, and we spent about three weeks in Japan in 2009, exploring Tokyo and the surrounding area, including unforgettable trips to the Ghibli Museum and studio. The exhibition in Japan was a follow up to another Disney exhibition three years earlier, featuring an array of artists from the 1940s to 1960s. It was discovered that Mary's work was significantly more popular with visitors than any of the other artists, laying the foundation for a solo show of her work. Mary's solo show started off slowly, worrying the organizers, but word of mouth led to steady increases in attendance, and by the end of its run, Mary's exhibition surpassed the Disney group show by a healthy margin (and the vast majority of the visitors were female, probably 80-90%). With Kevin's death, his cousins realized that the collection would be very cost-prohibitive for them to properly maintain, so they sold the Disney materials to Diane Disney Miller's Walt Disney Family Museum and Mary's personal art, advertisements and other works to the Ghibli Museum. 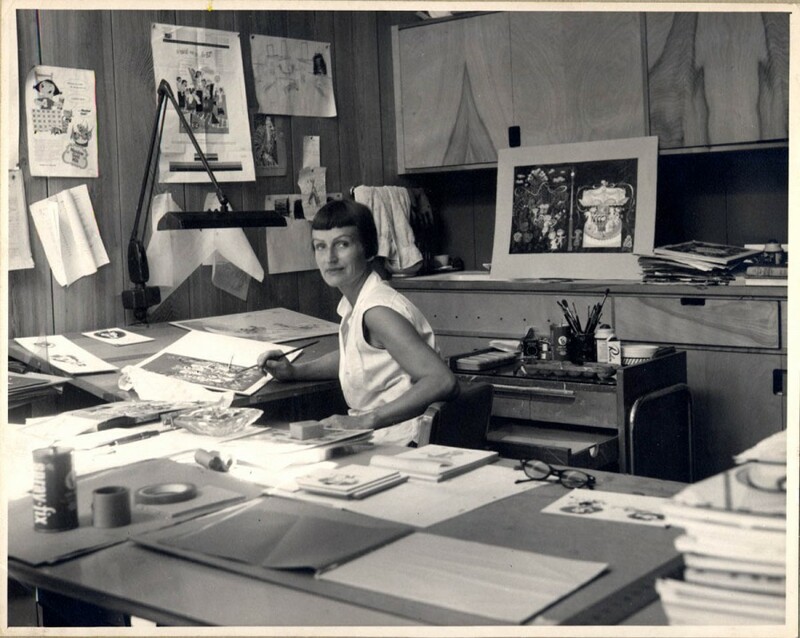 Five years later, Mary's getting a big show at the Walt Disney Family Museum, curated by John Canemaker, whose book The Art and Flair of Mary Blair helped seal our decision to put together a Mary Blair exhibition at the Cartoon Art Museum back in 2007. It's a small world, after all. Shaenon and I spent last week in Pittsburgh, visiting her family and attending the National Cartoonists Society's Reuben Awards festivities. It was our fifth time attending in six years (our friends Mohamed and Jen got married over Memorial Day weekend last year, so we missed out), and it's amazing how quickly we've gone from rank outsiders to being a real part of the group, and how much we look forward to catching up with our cartooning pals. 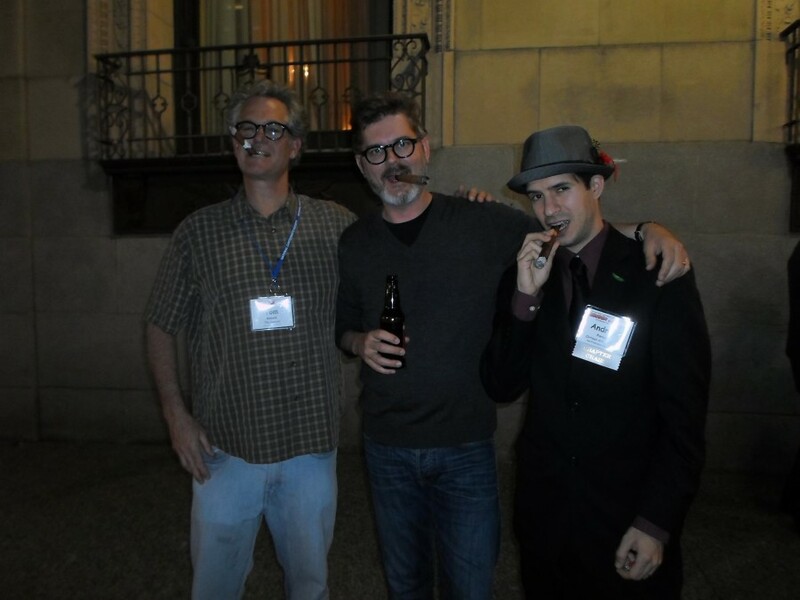 Here's a shot of comedy writer, producer and cartoonist Tom Gammill, famed children's book creator Mo Willems, and me outside of the William Penn Omni Hotel in Pittsburgh, enjoying cigars courtesy of Momma and Miss Peach creator Mell Lazarus. Just out of the shot are Shaenon, Jeff Keane, who let each of us take a drag off of Bil Keane's pipe, Mark Tatulli, creator of the strips Lio and Heart of the City, Dan Piraro, creator of Bizarro, Tea Fougner of King Features, and a bunch of other ne'er-do-wells. Looking forward to next year's festivities in San Diego, although I'm a little disappointed that I'll be spending yet another weekend in the Gaslamp District, which I'm very familiar with thanks to Comic-Con. It's nice when the Reubens bring me someplace I haven't been able to visit before. IAnother Alternative Press Expo has come and gone. This was my 12th year at the show, which was launched by publisher Dan Vado (SLG) in 1994. This was probably my busiest show yet, too. For the third year in a row, the APE organizers asked me to run some DIY workshops, so the convention really started back in August for me, when I began lining up cartoonists to conduct one-hour seminars on subjects ranging from building a webcomics audience to finding a collaborator to Watercolors 101. This one always requires a little bit of juggling, but we had a really enthusiastic group of teachers this year, and things went pretty smoothly by all accounts. It's been a while since I've added a house update, so sit tight and prepare yourselves for the next round of home improvements. After two-and-a-half years of wrestling with it, we're finally replacing the sliding doors at the rear of our kitchen with a new set. That's in the "in progress" mode, so no photos yet. The doors, of course, lead to our spacious deck. I also ordered a range hood for our stove, which will tide us over a little while longer in the kitchen upgrade department. Still planning to tile over the yellow-orange, chipped and stained countertops and switching to a newer, trendier, retro-style sink. In the "we knew this was going to happen" department, our water heater gave up the ghost, Exorcist-style, spewing water all over the basement. Some comic bags were dampened, some unbagged comics (newer stuff, thankfully) got a little bit warped, some boxes had to be tossed, but it could have been a lot worse. I discovered something was amiss in the basement late last night when I noticed that our bedroom floor (directly above the basement) was warm, almost hot. I asked Shaenon, who was half-awake, if I should check the basement, and she said "that's a great idea" before falling back asleep. The basement was sweltering when I opened the door, and after a brief moment of panic I hauled several moistened long boxes onto our deck and commenced drying them. While doing that, I shut down the gas on the heater, which turned out to be a good idea since our 15-year-old tank had sprung a bit of a leak and neither of the emergency shutoffs managed to activate (another one for the revenge-against-the-previous-owners list). This morning, I got to do some of that adult stuff I never thought I'd have to deal with, calling plumbers, getting estimates and making snap decisions about water heaters. We ultimately went with a local plumber who's installing a tankless water heater for us at less than half the price of our first estimate (which sounded fine at 9am after not getting any sleep all night and just wanting to get everything fixed). Due to his workload, the plumber's installing the whole thing over the course of three days, and we've got to get an electrician to come in and finish the job, but I should be able to take a nice hot shower by Wednesday night if all goes according to plan at this point. It's a hassle, and I'm not excited about spending the money that we're dropping on essentially just getting our house functioning as well as it did on Saturday, but it should improve the house's resale value, save us a little bit on the gas bills, make the house a lot safer, stabilize the temperature in the basement (where I store my comic book collection) and hopefully make it so we don't have think about the water heater again for another ten or fifteen years. And that's our house update. I'll try to post photos once some of this stuff has finally happened--and I'm clean again. It's been a pretty whirlwind month for me, but I guess that's a good thing. Since April 16, I've been installing one exhibition after another exhibition after another at The Cartoon Art Museum, including an Avengers movie tie-in and a MAD 60th anniversary exhibition, which is one of the best I've ever done. It's one of those shows that I couldn't have done half as well five years ago, and one that makes me feel I've really gotten the hang of all this. 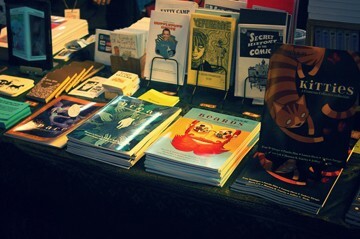 In the middle of all that, I went to the Stumptown Comics Fest in Portland, and, as usual, had a great time. It's always fun to catch up with old friends there, and we allowed ourselves a couple of extra days this time around to kick around the city and the surrounding areas. On the upcoming convention circuit, I'll be at the Big Wow! ComicFest this weekend, selling copies of The Looney Tunes Treasury and various other books along with my friends from The Couscous Collective. Catch me there or moderating as many panels as the Big Wow! team can have me moderate. The big news for the day, though, is that I was named "Best Professional Fanboy of San Francisco" by The SF Weekly. This was a complete surprise, and I'd probably have missed out on it entirely if one of our regular volunteers hadn't tipped me off. I'm not sure how to parlay this into anything beyond an extra page in my scrapbook, but I'm sure I'll think of something. If it drives more people to the Cartoon Art Museum, I'm happy. And since I haven't updated in a while, I'll mention that I've got two book proposals in the works right now, one with a contract to be signed sometime in the next week (fingers crossed), the other to be pitched soon. Wish me luck. San Francisco, CA: In 1952, editor Harvey Kurtzman and publisher William Gaines launched MAD, one of the most influential and imitated humor publications in the world. Originally created to parody popular TV shows, movies and, inevitably, comic books, MAD soon expanded into a wide-ranging satire of modern American culture. Features like the MAD Fold-In, “Spy vs. Spy,” the wacky sound effects of “MAD’s Maddest Artist” Don Martin, the “marginal” cartoons of Sergio Aragones, and the motto “What, me worry?” have become indelible parts of popular culture, and the magazine’s mascot, Alfred E. Neuman, is one of the world’s most recognizable faces. The Cartoon Art Museum’s latest exhibition, What, Me Worry? 60 Years of MAD celebrates the rich history of MAD from the original comic book through the black-and-white magazine to its latest incarnation as a full-color bi-monthly publication supplemented by online content. This is the museum’s first exhibition to include both the MAD comic book and magazine. The MAD creators, known affectionately as “The Usual Gang of Idiots,” are among the most highly regarded in the cartooning world, and works from nearly every major MAD contributor will be featured in this gallery. Exhibition highlights include cover artwork by MAD creator Harvey Kurtzman; pages from the MAD comic book by Will Elder and John Severin; early magazine-era artwork by famed artists Mort Drucker, Don Martin, Wally Wood and George Woodbridge; MAD Fold-ins by Al Jaffee; painted covers by Sergio Aragonés, Jack Davis, Kelly Freas, Norman Mingo. Jack Rickard and Richard Williams; The Lighter Side of… by Dave Berg; Spy vs. Spy by Antonio Prohias; a look at Tom Richmond’s creative process; the dazzling caricatures of Sam Viviano; comics from contemporary contributors Chris Baldwin, Evan Dorkin, Peter Kuper, Ted Rall, Keith Knight and Joey Alison Sayers; a look at MAD Magazine around the world; and much, much more! Programming featuring MAD creators will be held through the duration of the exhibition. Please stay tuned for announcements as special guests are confirmed. Vote for Shaenon K. Garrity's and Jeffrey C. Wells's webcomic Skin Horse in this thing: Skin Horse is matchup #19, and it takes about two seconds to vote. And if they win, they get...it looks like the chance to go up against some other comic in the next round of voting. If there's a massive cash prize, we promise to use it responsibly. Just found out that John Severin passed away on Sunday. He was a longtime favorite of mine, dating back to my discovery of his work in Cracked Magazine. I'm sure that I read Cracked for at least a year beyond when I stopped really enjoying it because I knew there'd be new material from Severin. I don't remember being especially impressed with the writing, but I read the book up until cancellation (or when the local pharmacy stopped carrying it, which amounted to the same thing). There aren't a lot of artists whose work I'd buy regardless of the quality of the writing, but I've picked up a lot of beautifully drawn, not so beautifully written Severin comics over the past 20 years. It was a real treat when some of his peak material started appearing in collected editions, like Marvel's Essential reprint line, with Severin's inking over Herb Trimpe's pencils and the just-released-although-I'm-not-sure-if-he's-in-the-first-collection Sgt. Fury collection. And it was great to get my hands on some early Mad collections, so that I could see what Severin could do with a top-notch writer like Harvey Kurtzman. Even better is his work on EC's war titles, and I'm hoping that Fantagraphics puts out a single-artist collection of his work in the near future. Last month, John's wife called me at work. My immediate reaction, especially with all the elder statesmen of the comics industry who've passed away in recent months, was that she was going to be the bearer of bad news. I was relieved to find out that she was calling to make an art donation to the Cartoon Art Museum. "Do you know my husband's work? He drew a Rawhide Kid comic book about ten years ago, and there was a lot of press about it at the time." We chatted about it, talked about the weather in Colorado (where the Severins live, and where I attended college), and a week later, she sent us every single page of John's recent Rawhide Kid mini-series. Every. Single. Page. In hindsight, I realize that his health must have been in decline by that point, and that his wife wanted to get his artwork somewhere that could benefit the artistic community, and where it would be preserved for future generations. But really, John Severin's legacy is secure. His EC work, his humor comics, his westerns, his war comics... I worry that it's damning with faint praise to say that he was the best artist in Cracked Magazine, but several generations worth of kids who couldn't wait another couple of weeks to buy MAD loved his stuff. In 1992, seven of the most popular comic book artists in the world joined forces to create Image Comics, a company specializing in the publication of creator-owned comics and graphic novels. The first wave of Image Comics were an immediate hit with fans, and the company has grown over the past two decades to become one of the largest comics publishers in North America. In addition to publishing work by the Image partners, they give a voice to work by numerous independent creators. Its best known series include The Walking Dead, Chew, Morning Glories, Spawn, Savage Dragon, Witchblade, The Darkness, and Invincible. The Cartoon Art Museum’s exhibition Image Comics: A 20th Anniversary Celebration features over 40 pieces of original artwork spanning 20 years, including works from all seven Image founders, Erik Larsen (Savage Dragon), Jim Lee (WildC.A.T.s), Rob Liefeld (Youngblood), Todd McFarlane (Spawn), Whilce Portacio (Wetworks), Marc Silvestri (Cyberforce), and Jim Valentino (Shadowhawk). Works from Image partner Robert Kirkman (Invincible, The Walking Dead) will also be included in this historic exhibition. This party kicks off the three-day Image Expo which will be held at the Oakland Convention Center from Friday, February 24 through Sunday, February 26. Please visit http://www.imagecomicexpo.com/for details. Image Expo is the premier Northern California comics convention in 2012. The three-day event takes place at the Oakland Convention Center February 24, 25 and 26. Celebrating the creative spirit of independence, Image Expo commemorates the twentieth anniversary of the formation of Image Comics. But more than just looking to the past, the event showcases the evolving the comic market by spotlighting the future of independent publishing. Headline guests include Image Comics Founders & Partners Robert Kirkman, Erik Larsen, Rob Liefeld, Todd McFarlane, Marc Silvestri, and Jim Valentino. Special guests for Image Comic Expo include Brian K. Vaughan, Fiona Staples, Blair Butler, Ed Brubaker, Joe Casey, John Layman, Jonathan Hickman, and many more! Another convention season has come and gone. I'm planning a bigger writeup about APE 2011, with some reflections on my first con as an exhibitor, APE 2001, and I'll announce that here when it's ready to go. On the positive side, the Couscous Collective's table looked more professional than it ever has, and we've locked up a really nice floor space after several years of exhibiting as a group (and ten-plus when you count me, Shaenon and Jason Thompson). I had a lot of great conversations with old friends, talked about new and upcoming projects and exhibitions with people, and had a good time hanging out with the rest of my tablemates. Once again, I noticed that people stopping by the table would barely even look at the mini-comics/zines and cheaper items that we had for sale, which is kind of a sad trend. One thing I loved in the old days was that $20 would get me a big stack of comics at APE. Now that's going to get me an eight-page comic with a silkscreened cover and a paperback collection containing several mini-comics' worth of content. That trend has cut down pretty severely on the amount of new content I buy at conventions, since I'm not seeing that $2-3 entry point for an artist's work anymore. On the negative side? If you weren't Drawn & Quarterly (Kate Beaton was the 500-pound gorilla of the show, selling $20 hardcovers as fast as D&Q could collect money; Adrian Tomine and Dan Clowes generated big sales; and they've always got a lot of great books for sale at every convention already) or someone hosting a Craig Thompson signing, sales were pretty flat. I heard that from big publishers, small press, veteran exhibitors, and pretty much everyone I spoke to. Rather than being glad I'm not the only one who didn't clean up this weekend, I'm bummed that so few of us did much more than break even and maybe make enough extra for a couple of meals. What was working against APE this weekend? For one thing, Saturday and Sunday had some of the best weather we've seen in San Francisco all year. If you're on the fence about going to a comic show, that's going to factor into your decision. The other big sales killer? Hardly Strictly Bluegrass, a giant FREE outdoor music festival in San Francisco took place this weekend, far enough away that people were really unlikely to do both events. Add in the Castro Street Fair on Sunday, and that's two big events during perfect outdoor festival weather, plus both crowds being the type of people who'd be into an alternative comics show, and that had to have an impact on the number of attendees. The warm weather made the Concourse warmer and muggier than expected, and most of my crew seemed to be operating at half-power throughout the weekend. Probably not so bad for attendees, who were moving around constantly, but that's the sort of thing that really hits an exhibitor. One last gripe (honest!) about small press shows, and I realize as I'm typing it that it's not completely reasonable, is the number of attendees who come to these shows and tell me some variation of "I like your work, but I didn't bring any money." (Popular variations include "I already spent my money at .......'s table," or "I'm saving my money to buy ................ later," or "can I get this on Amazon?") At shows like WonderCon and Comic-Con, people plan to buy. They'll take $100-200 out of the bank, then have a checkbook and a credit card ready to go in case they burn through that. At APE and Stumptown, people plan to pay admission, then maybe set aside $20 for the entire show. After your must-get book from one of the special invited guests (Beaton, Thompson, Tomine, Clowes, Shannon Wheeler, Matthew Thurber) or that Dr. Who-zombie-Star Wars-mustaches mash-up print, there's not much left to spread out among the nearly 400 other exhibitors. Yes, APE attracts a different crowd than the shows that spotlight Marvel and DC and Hollywood movies, but it's still frustrating. Yes, it's great that people are supporting the convention by attending it. No attendees means no reason for organizers to put a show together. Yes, it's great that so many people are attending, and that they're going to panels and workshops and looking at our wares. But it would be nice if more of these people came to the show with the intention of buying comics. Sure, attendees are fans and supporters of the arts, and they don't necessarily have a lot of discretionary income, but for a show like this, they're pretty likely to be Bay Area residents. That means minimal travel costs and no hotel costs. Exhibitors may be local enough to avoid those travel costs, but a full table at APE is $250 with an early-bird discount, $300 if you miss that deadline, and I'm guessing that puts half-tables at $150 for the early-birds and $175 for people who register later. Printing costs for a mini-comic (not counting an artist's time investment) will probably be $60 on the very low end for a 100-copy print run of a zine, a nice banner will run $30-150 depending on whether it's loose or you invest in a display system, add in another $50 for miscellaneous costs along the way and it's pretty easy for an exhibiting artist to be $200 in the whole first thing Saturday morning. When attendees don't spend money, artists don't, either. If I have a busy morning at a convention, I can take some time away from my table in the afternoon to visit friends and drop some money on their books. When sales tank, it's harder to justify buying anything, and it's also harder to justify time away from your table, since that's time you won't be working toward making back your table costs. However broke an attendee claims to be at a show like this, the artist on the other side is broker. I think I had the same complaint the last time I wrote about APE, so that's just something that we've got to deal with until the economy improves, but I wish more of the attendees would squirrel away a few bucks here and there leading up to APE. All in all, I still have a great time at the convention, and I'll be back for more next year. No more complaints from me until Stumptown 2012. Two posts in one day, after a several month absence from LiveJournal. Go figure. Now that I've successfully distributed my author copies of The Looney Tunes Treasury to most of my friends and family (and those I've forgotten will probably remind me soon enough), I'm going to start selling off copies through The Couscous Collective Store. Loads of other fun stuff, including The Comics Guide to the Mission, SPACE, FOREST and other odds and ends are available there, too. Anyway, $55 plus shipping will get you a personalized copy of The Looney Tunes Treasury featuring a character sketch of your choosing (I assume you'll want a Looney Tunes character, but if you'd rather have Fred Flintstone or Daredevil telling you to enjoy your book, I'm sure we can work something out). Proceeds from sales of the book will help me buy a new laptop, which I'll use to write my next book, which I'll hopefully announce here once the contracts have been worked out (featuring a character who's been one of my favorites for almost as long as the Looney Tunes). One of the great unsung heroes of the entire comics industry, Bill Blackbeard, passed away last month. Today would have been his 85th birthday. Bill is best known for his work on the absolutely indispensable The Smithsonian Collection of Newspaper Comics, which was the culmination of more than a decade's worth of research and salvage in his attempt to assemble a complete archive of every major (and almost every minor) comic strip published in American newspapers. Do a google search for him and you'll find a number of glowing tributes detailing his efforts, or, if you want a quick illustrated version, read through my four-page comics tribute that I drew back in 2003. I never met Bill in person, and only had a few brief periods of correspondence with him, mostly while preparing that comic, and I'm still kicking myself for not taking the time to rent a car, dust off my tape recorder and spend an afternoon shooting the breeze with him about comics, about the changing face of comics scholarship, and just to shake his hand and thank him for everything he's done. Someone summed up his legacy really succinctly by saying "Bill Blackbeard gave comics its memory," and that pretty much says it. Big thanks to Patrick Owsley for this! Please visit his websites: http://powsley.blogspot.com/, http://www.coroflot.com/powsley, http://www.patrickowsley.com! I missed this book when it came out last year, but one of our dedicated interns at the Cartoon Art Museum was reading Tony Isabella's 1,000 Comic Books You Must Read at the admissions desk last week. Pretty cool, huh? It's nice to know that someone read it. And by my count, that means "Moleman's Christmas" was one of the top 200 or 300 Marvel Comics of all time (or at least one of the 300 or so that you MUST READ). Not too shabby. Many many thanks again for your generous donation of The Looney Tunes Treasury. We've been holding on to it and looking for a record to copy, but although several large public libraries show it on order, none has yet cataloged it. So our intrepid cataloger Helen went ahead and cataloged it - here's a screenshot (you can resize to read it, or just go to our website www.wellington.lib.oh.us, click on Search the Catalog, and put in either the title or your name). There's also a bookplate inside with your name and that of Running Press. And it's already proven popular, as you can see by the holds before it's on the shelf! Mooch, Earl and Daffy Duck? Woo-hoo! It's a really incomplete list of animated features, with too many direct-to-video films included, and I could spend the rest of the day writing up a more complete list, but I'll just follow the instructions and leave it at that. Based on this list, it looks like I've got a few gaps in my Disney viewing (but nothing that anyone would consider "gems"), I haven't seen much anime at all, and I haven't bothered with some pretty wide swaths of non-Disney features. On the whole, though, I think I've seen a lot more animation than the average non-parent. [X] Beavis & Butthead Do America (1996).